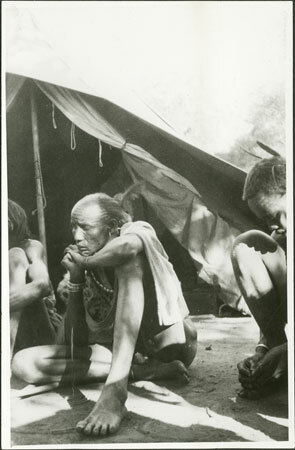 A close-up portrait of a seated man, possibly a leopard-skin priest (Kuaar Muon) since he has some cat skin draped over his right shoulder, sitting with his head resting on his hands amid other men in front of Evans-Pritchard's tent. The leopard-skin priest was a ritual rather than political authority, and acted as arbiter in disputes and in ritual activities such as spirit possession and sacrifice. The location is noted as Cieng Luony or village of the Lony secondary section of the Thiang primary section of the Gaajak tribe (Eastern Jikany group), probably located near the Nyanding/ Sobat confluence, and taken during the four weeks that Evans-Pritchard spent in this location in 1935. Note on print reverse ms pencil - "Cieng Luony (Thiang) Gaajak"
Notes on card mount ms pencil - "SS Upper RHS & lower RHS"
Morton, Chris. "Nuer man" Southern Sudan Project (in development). 03 Jan. 2006. Pitt Rivers Museum. <http://southernsudan.prm.ox.ac.uk/details/1998.346.361/>.